SpaceX has successfully landed an unmanned Falcon-9 rocket upright, after sending 11 satellites into orbit. The Falcon-9 craft touched down on December 21, about 10km from its launch pad at Cape Canaveral, Florida. It is not the first spacecraft to land a booster vertically; that feat was claimed by the much smaller New Shepard rocket in Texas last month. Nonetheless the Falcon-9 flight, which also went twice as high as New Shepard, is a milestone towards reusing rockets. SpaceX aims to slash the cost of private space operations with such reusable components – but the company has not launched a rocket since one exploded in June. SpaceX has a $1.6 billion contract with NASA to send supplies to the ISS. 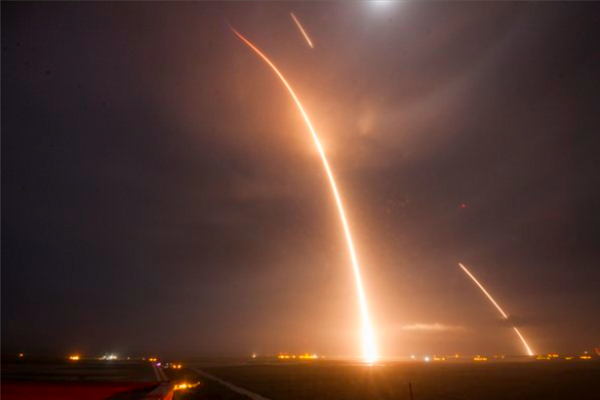 On Monday night, local time, the upgraded 23-storey-tall rocket took off from Cape Canaveral Air Force Station with the main stage returning about 10 minutes later to a landing site about 6 miles south of the launch pad. Near the peak of its flight, at an altitude of some 125 miles, it propelled the rocket’s first stage – laden with 11 communications satellites – into space. The flawless launch on December 21 is a major success for privately-owned Space Exploration Technologies, or SpaceX, the California-based company set up and run by high-tech entrepreneur Elon Musk. Elon Musk has said the ability to return its rockets to Earth so they can be reused and re-flown would hugely reduce his company’s operational costs in the growing but highly competitive private space launch industry. SpaceX employees broke out in celebration as they watched a live stream of the 156ft-tall white booster slowly descend to earth in the form of a glowing orange ball. “Welcome back, baby!” Elon Musk said in a celebratory tweet. SpaceX is aiming to revolutionize the rocket industry, which up until now has lost millions of dollars in discarded machinery and valuable rocket parts after each launch.